Woodpecker calls from a tree, "cuk-cuk-cuk." Starling sings, "whistle-ee-wee." But have you heard the nesting bird? In this book, we hear all the different bird calls in counterpoint to the pervasive quiet of a mama bird waiting for her eggs to hatch. Fun and informative back matter takes the shape of an interview so that readers learn more right from the bird's bill. 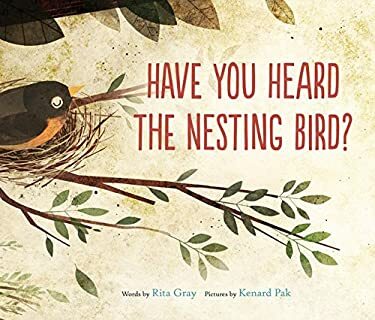 Ken Pak's lively illustrations, paired with Rita Gray's words, render a visual and sonorous picture book to be enjoyed by young naturalists.